The information provided in this article is intended to help you properly set up your TweetFavy account and to exemplify how you can get the best performance out of our service. The first screen you’ll be prompted with after creating your TweetFavy account is your dashboard, this is where you’ll receive insight to the performance of your Twitter profile and where you can create your targets. The left hand side of our analytics panel visualizes how many engagements have been made for your account whilst using TweetFavy. We use the term “engagements” for all the activity that TweetFavy has made on behalf of your Twitter account; automated likes, retweets, follows, direct messages, lists and replies. The right hand side of our analytics panel shows you how many people have followed you as a result of TweetFavy interacting with their Twitter account. Targets are general keywords that our system will use to find tweets to like, retweet or follow other users with on behalf of your Twitter account. For example, if your target consists of a single keyword like: “cars”, TweetFavy will search for tweets that mention this keyword and will continue to like, retweet or follow accounts based on the tweets that are most likely going to give you engagement or interaction. Whilst creating the keywords for your targets, you’ll see a colored dot appear on right side of the entry field. This indicator validates the effectiveness of your target by showing you how many tweets that we can find for your search term. Unless your keywords are created to specifically engage with a niche audience, we’d recommend you alter them if the indicator turns red. You’re also able to change the aggressiveness of your targets from the same menu. Once you’ve created your keywords, set the timer to execute on the intervals that you desire; 15, 30 or 60 minutes. Having a smaller delay between the execution times of your target will generally result in better conversions. Try to avoid using conjunctions in your targets as they’re not necessary and will only lower the amount of engagements that our system is able to make on behalf of your account. Using this type of target will give your Twitter account increased interaction based on likes. Our system will find tweets based on the keywords in your targets and will continue to give them likes. In our experience using a like-target will give you a good and steady amount of conversions. 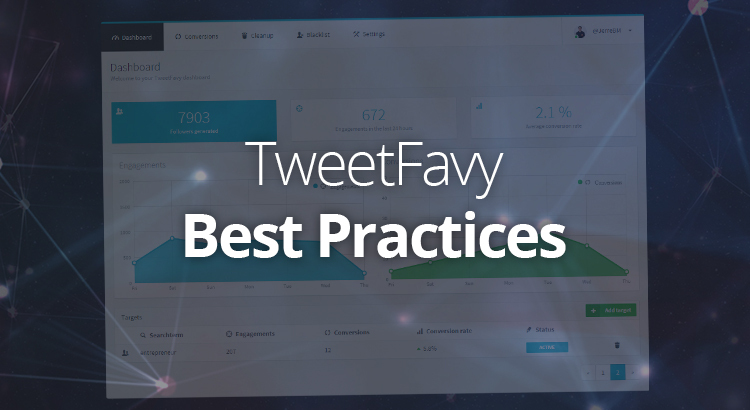 TweetFavy will use the keywords in your targets to find tweets and retweet them. We’d recommend using this type of target if you’re absolutely certain that your keywords won’t trigger undesired retweets that will damage your Twitter profile. A follow target will use your keywords to find tweets and follow their authors. It will also search for matching keywords in Twitter users’ biographies, select the best matches and follow them. We’ve experienced very high amounts of conversions when using the follow target. However, keep in mind that the OR needs to be capitalized or else the operator won’t work. We also recommend using a maximum of 5 OR operators in one target stroke or else the target will lose its effectiveness. The sentiment filter works according to a relatively simple rule; if a tweet contains more bad words than good words it’s classified as a negative tweet; it works the other way around for a positive tweet. Should you want to target tweets that are sent from a certain location you can use the location filter. Click on the “add target” button, from there you’ll be able to find the “enable location filter” button under the target field. You’ll be able to pinpoint a location on the map and set the exact radius in which you’d like to target your audience. However, keep in mind that for most tweets we aren’t able to properly determine the locations. As a result, making use of the location filter will result in a lot less engagements being made as opposed to targets without the location filter enabled. If the geographic location isn’t absolutely crucial for your target, consider using the language filter instead. To get a full overview of all the operators and filters that you can apply to your targets click on the “view all operators” button. As soon as you’ve properly created your targets, our service will make impressions for you. Impressions are engagements that TweetFavy has made on behalf of your Twitter account. Once our service has made a decent amount of engagements for you, you’ll notice new conversions will appear in your dashboard. Conversions are the Twitter users that have followed you as a result of the engagements that TweetFavy has made for you. You can get a list of all your new followers in your conversions overview. Now that people are following your Twitter account it’s important to keep them interested by posting new content or by interacting directly with them. Our service can only gather followers for your account but we cannot guarantee their stay, this is up to you. If you’re worried about the amount of tweets that TweetFavy has engaged with on behalf of your Twitter account, you may choose to activate the cleanup tool. It will automatically revert the past engagements on your account. We recommend setting the cleanup tool to 3 days since the counter on your Twitter profile has a tendency to clutter up if likes aren’t removed after more than 4 days. Keep in mind that even though our system will delete the likes, the # of likes shown on your Twitter profile page might not always update to accurately reflect this. This is a bug on Twitter’s end which we cannot affect. Want to exclude someone from being engaged with? Add their Twitter handles to the blacklist and they won’t receive impressions from TweetFavy anymore. In the settings page you’ll be able to make alterations to your TweetFavy profile. With the referral link you’ll be able to receive free months of TweetFavy by referring users to use our service. Once they sign up for TweetFavy they’ll receive a trial of one month, if they sign up for a subscription after their trial you’ll receive an extra free month of our service as well. You can find your unique referral link in the settings page of your account. There are a lot of factors at play when it comes to getting the most out of your Twitter profile and making sure you receive as much followers and interaction as possible. We recommend making sure your Twitter profile is inviting people to engage or follow you, take a look at this guide which goes deeper into the anatomy of a perfect profile. If you’re using TweetFavy from a business perspective, there are some tricks you can perform to turn users on Twitter into new customers. This guide gives you a clear strategy on how you can use our service to grow your business.